"The old adage “many hands make light work” fits perfectly here—commandeer some friends and have a fence-building party!" Once you've set fence posts by following our simple steps below, learn how to build three types of fences by visiting our vertical fence, horizontal board fence, and framed-panel fence tutorials—and prolong your fence with LifeTime Wood Treatment. 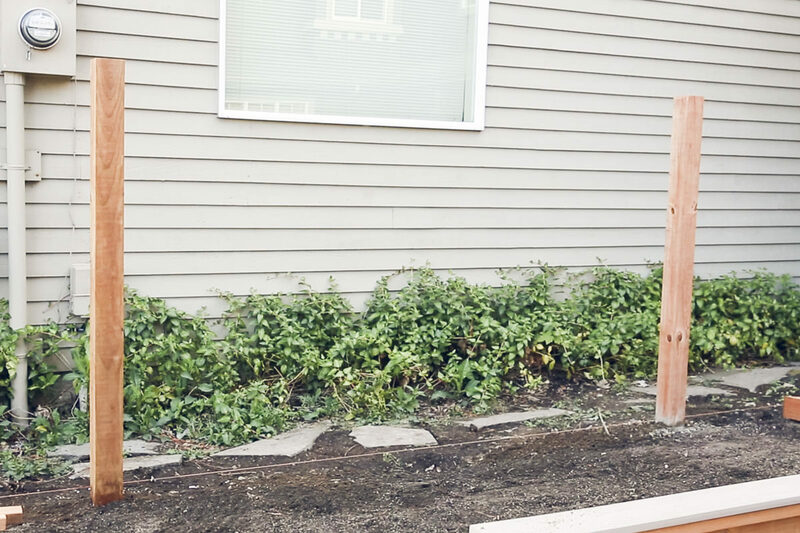 Building your own fence isn’t just rewarding—it’ll also save you a lot of money. The first step to building your own fence is setting your fence posts. Today, I’m walking you through the basics. 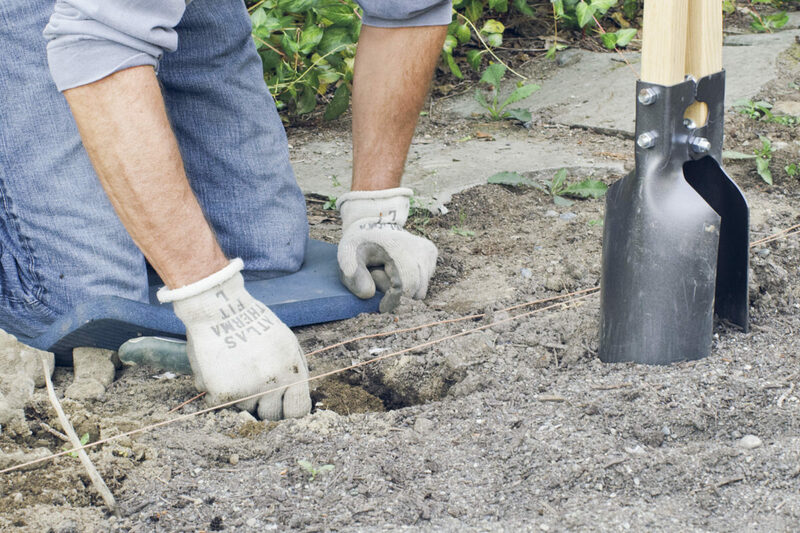 Before breaking ground, you’ll want to make sure there aren’t any buried wires, pipes, and so forth in the areas you’ll be digging. Most municipalities can arrange for a free visit to your site where anything to avoid will be marked with flags or spray paint. Note: If you take this route, ask that they use a non-permanent paint in areas of high visibility (like your front driveway). Make a plan for the placement of each post. As a general rule, posts should be set 8’ on center (96” from the center of one post to the center of the next). 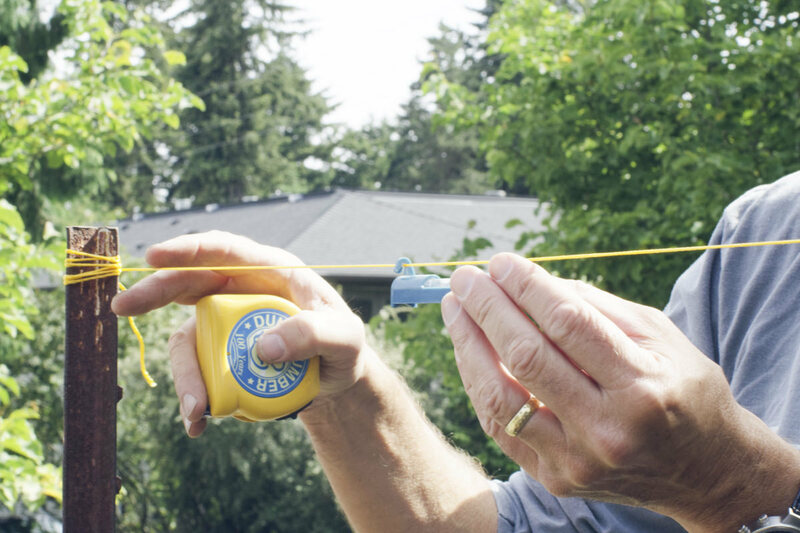 You’ll also want a straight run, so marking with a string line, chalk, or paint will help you dig in the right spot. 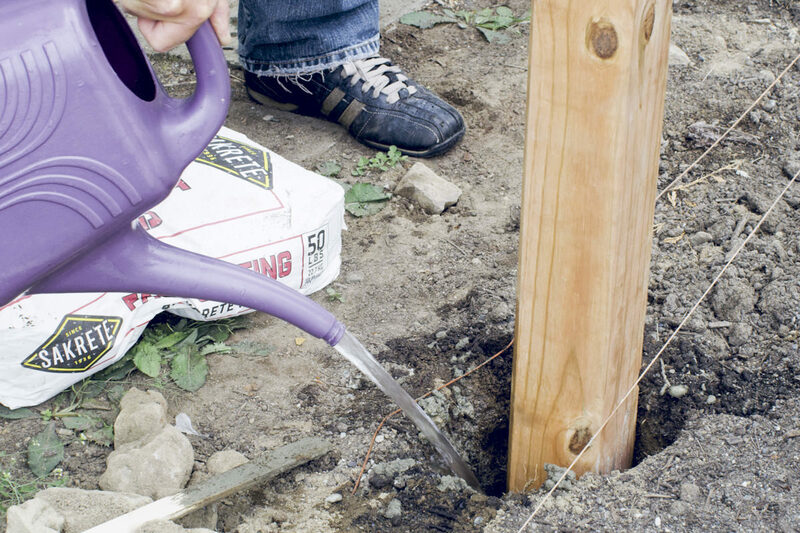 Shovels, manual post-hole diggers, and power post-hole diggers are common ways to dig fence post holes. Choose the method that best fits your project. If you only have a few holes to dig, manual digging probably makes sense. If you have a whole property to fence, a powered post-hole digger will save a lot of physical labor. How deep and wide should you make the hole? 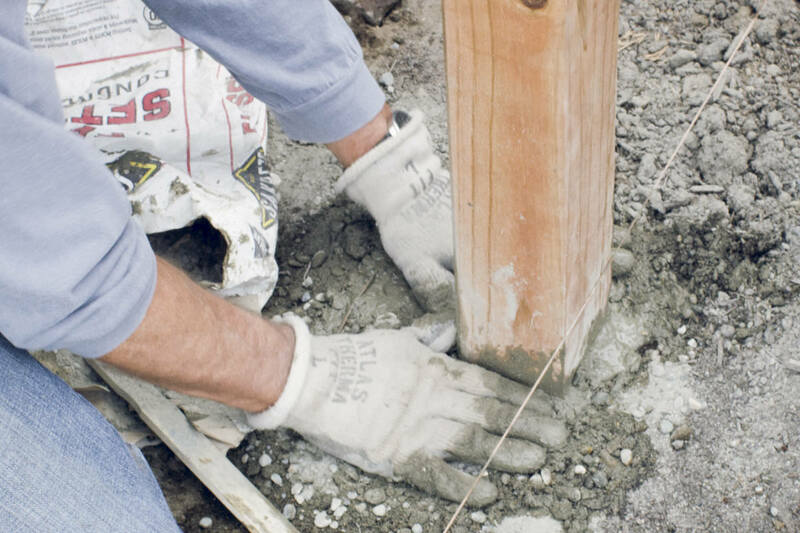 That depends on different factors including the height of the fence and the method you’re using to anchor the posts. Guidelines are generally printed on the concrete or post-fill product packaging. The old adage “many hands make light work” fits perfectly here—commandeer some friends and have a fence-building party! 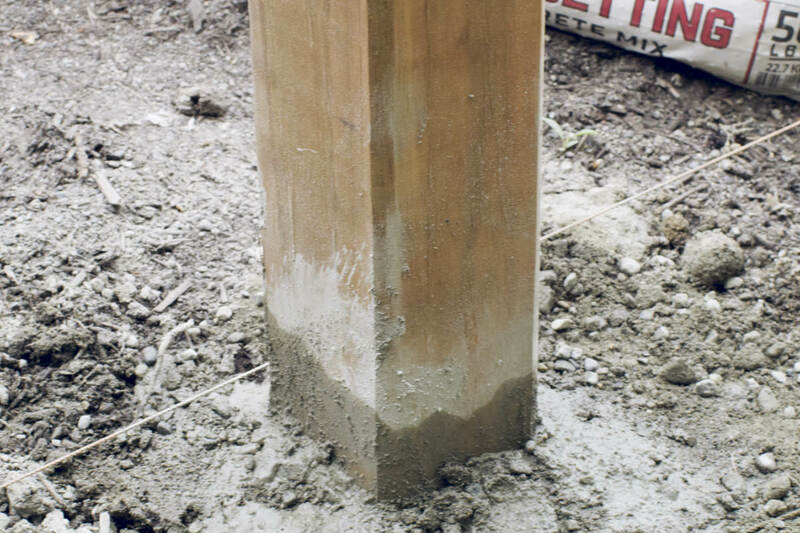 We’ve used pressure-treated lumber for the posts here. They’re a great choice because pressure-treated lumber is treated to resist rot, even when it's buried in the ground. Setting a post at either end of the stretch is a great way to establish the line for the run. If your ground is level, you can establish the height of the posts at this time by running line between the tops of the two end posts. 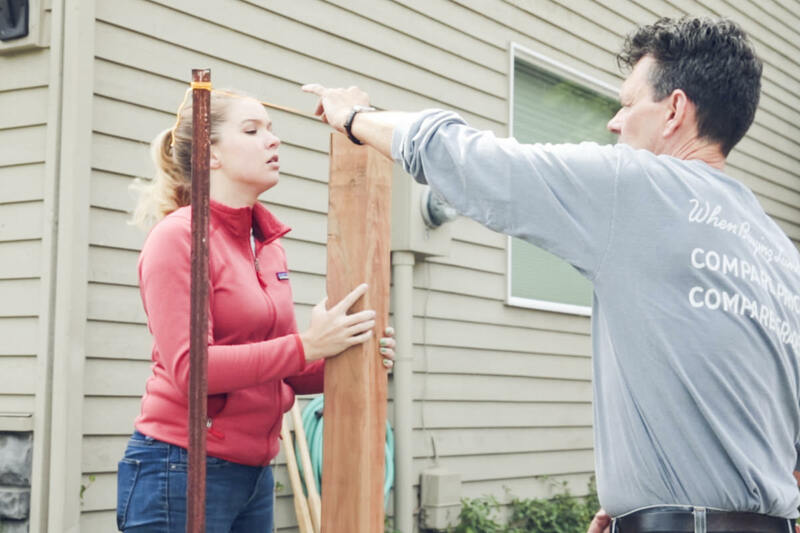 You can trim the top of the posts later, too, but keep in mind you’ll either need a handsaw (and a lot of patience) or a power saw that can cut through a four-by-four. To set the posts straight, have a level, some boards, and stakes on hand to brace the post in place if needed. We used a post level, but a regular level can work just fine, too. 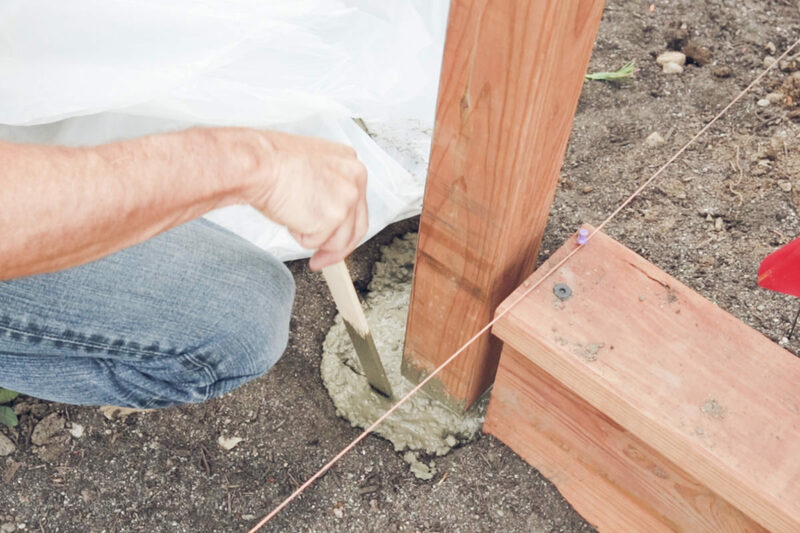 There are a few ways to set a fence post with concrete. 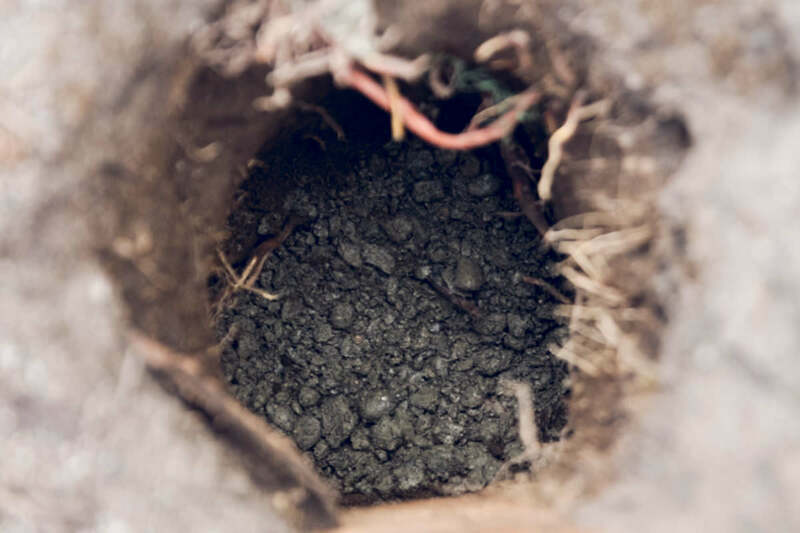 Regardless of the method you choose, put a few inches of gravel in the bottom of your hole and tamp it down with the bottom of the post. 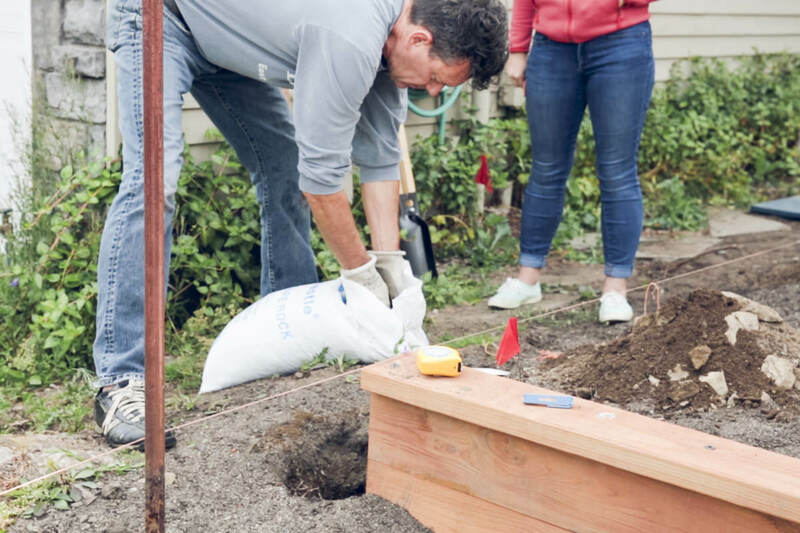 Keep the post in the hole and either brace it in place or have one of your helpers to make sure it’s placed just where you want it—straight along the line you established earlier. There are also different types of concrete mix. 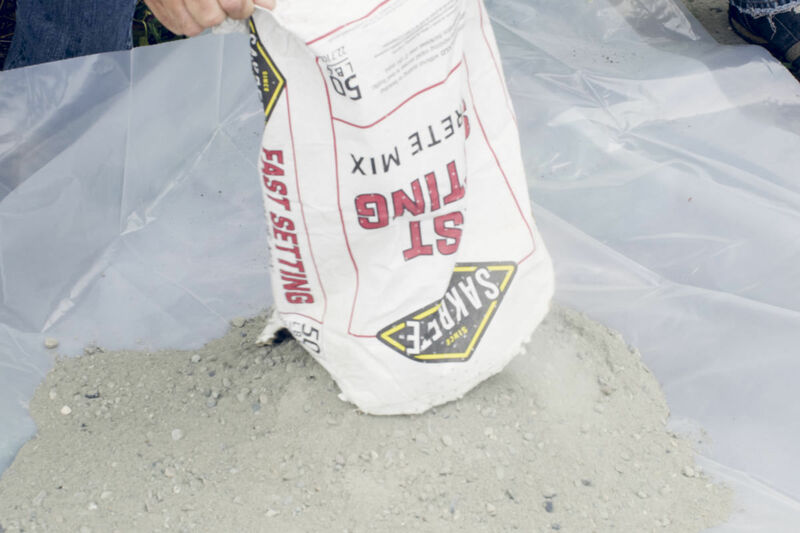 Fast-setting concrete mix will set up quicker than regular mix and generally doesn’t require bracing while the mixture sets. 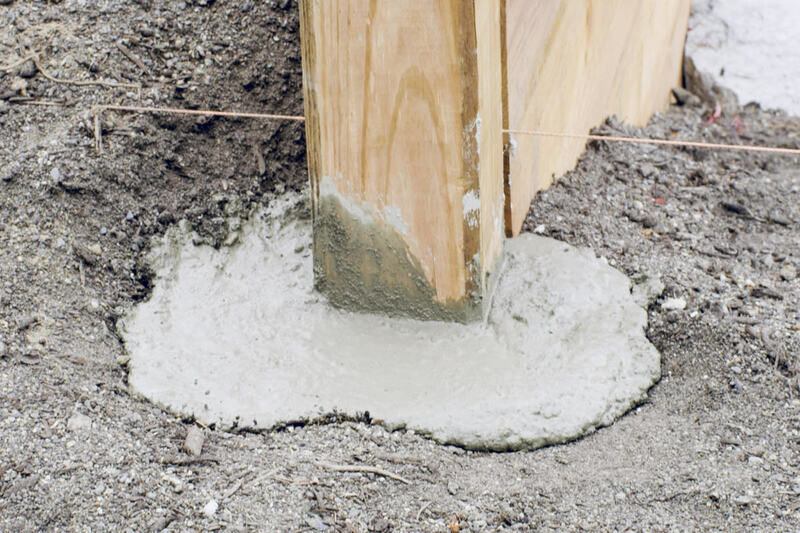 Regular concrete will take longer to set and may require the post to be braced, but it’s less expensive. 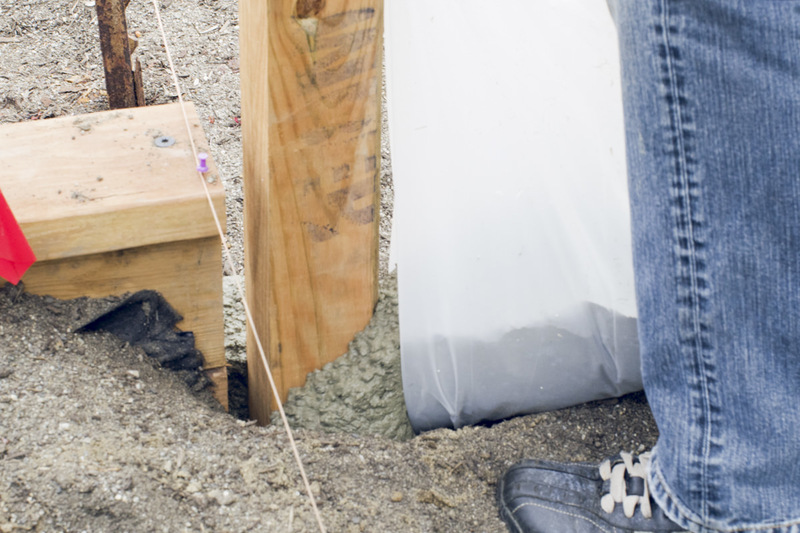 One of my favorite methods of setting concrete is mixing it outside of the hole. It requires two people, so be prepared for that. 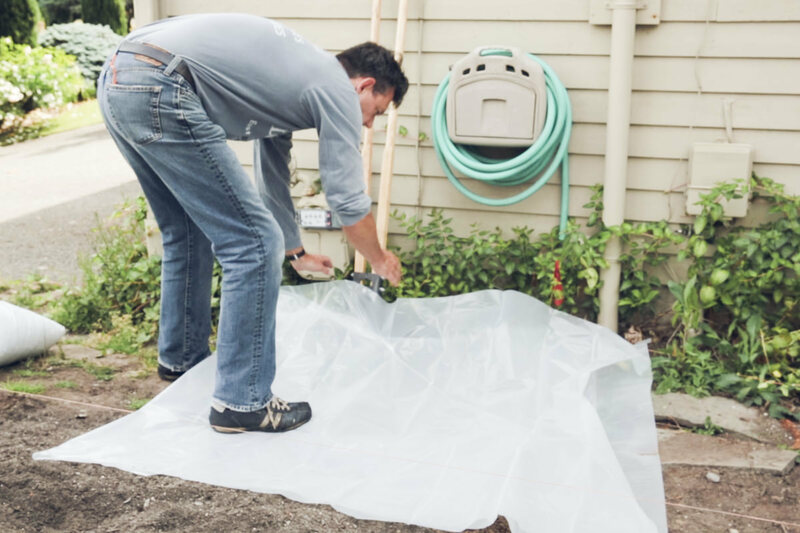 To start, lay out a double layer of polyethylene on the ground next to your hole. 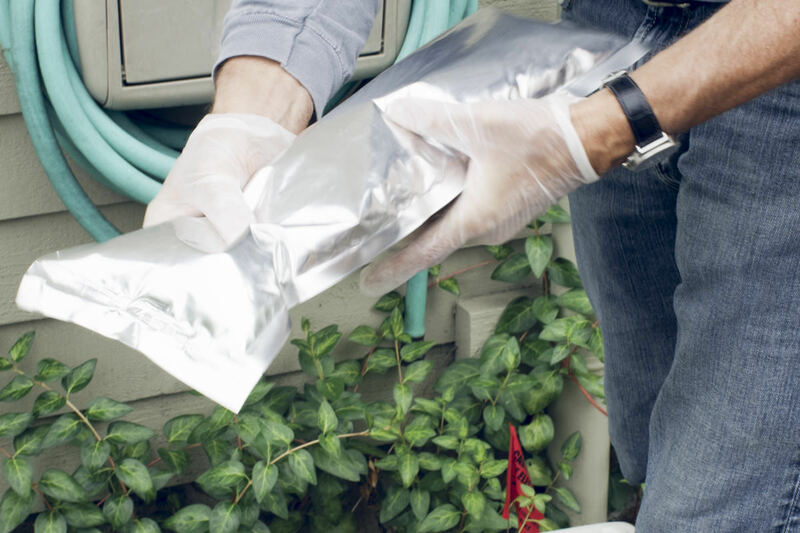 Cut open your bag of concrete and pour it onto the plastic. Add some water. 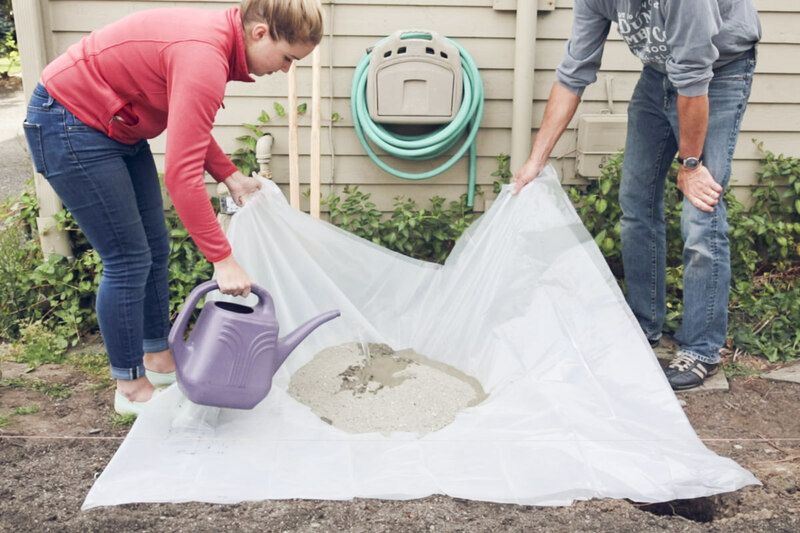 Next, with your partner, lift alternating corners of the sheet to sift the dry mix so it combines with the water. Add more water until you have the right consistency, and mix until all the dry mix is moistened. 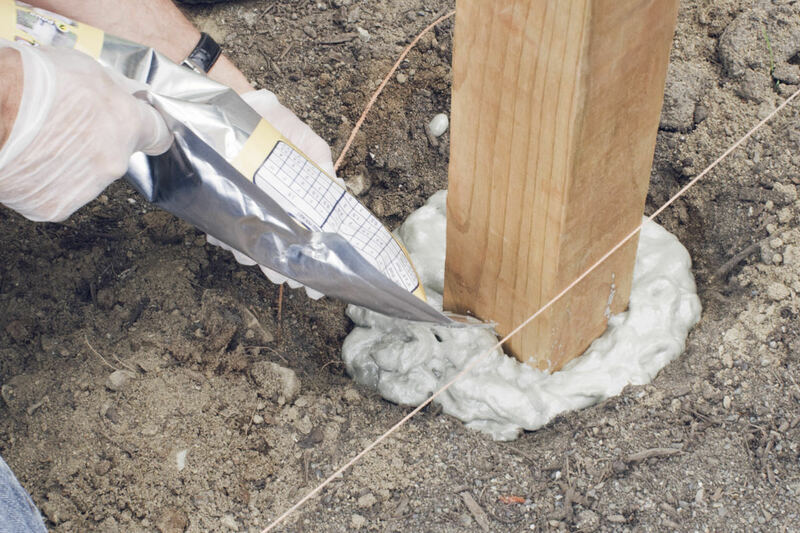 Now, pour around the post directly from your sheet by lifting one side of the polyethylene. Slope the wet concrete away from the post at ground level so rain will drain away from your fence post and not puddle around it. Check to make sure it’s level, put temporary braces in place if needed, and move on to the next post. 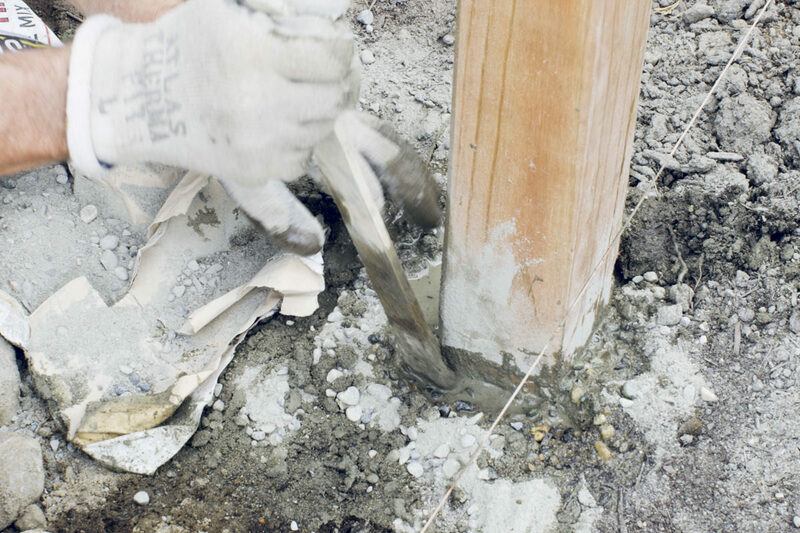 You can also choose to add water and dry mix directly into the hole around the post. After you’ve tamped your gravel and set the post in the right spot (centered in the hole), fill the hole about a third full of water. Then, dump in the bag of concrete and mix with a stick. 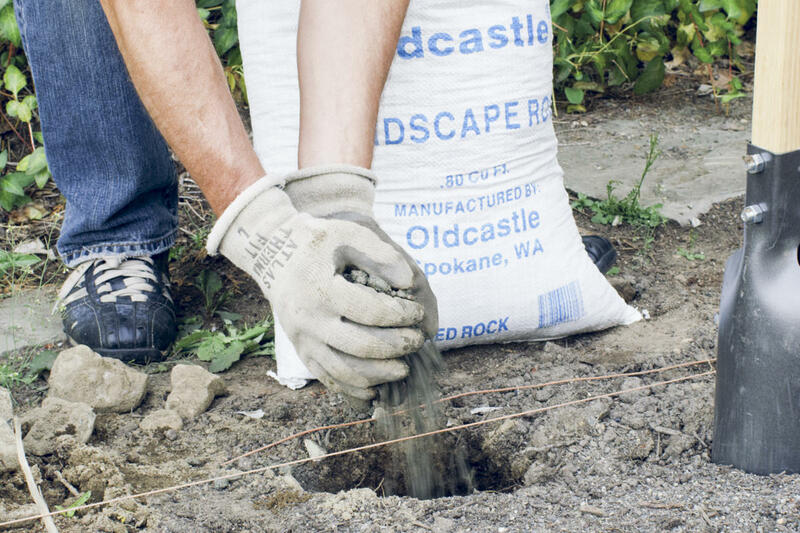 Add more water and/or concrete to achieve the right consistency, and fill the hole to ground level. 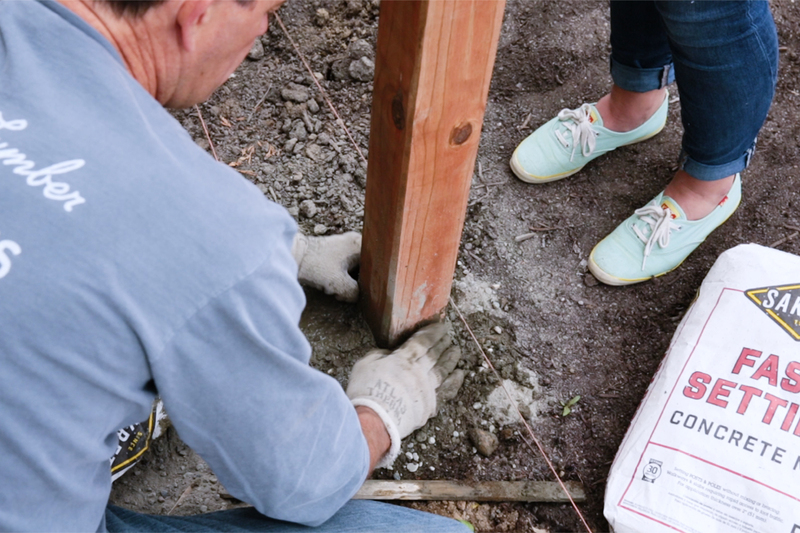 Mold the wet concrete so that it slopes away from the post. This will help keep rain or irrigation water from puddling against the fence post. Double check to make sure things are straight and aligned, and put up temporary braces if needed while the concrete sets. A third option is back-fill foam, which can be used instead of concrete. This foam is quick, easy, and lightweight—no hauling 60 lb. bags of concrete! It costs a bit more than concrete, but can be a real labor-saver. 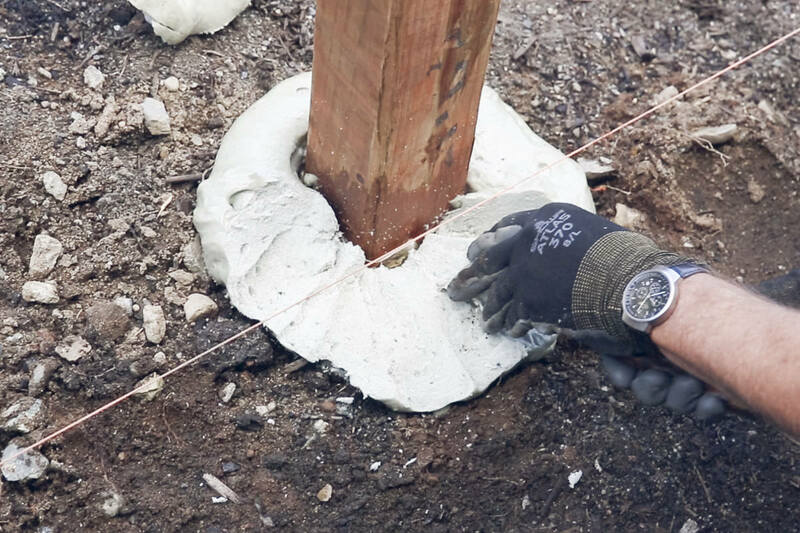 Posts anchored with this method can be put to use within minutes, whereas posts anchored in concrete shouldn’t be disturbed for hours or days (depending on whether you used fast-setting or regular concrete). Here’s how to use back-fill foam: With your post loose in the hole, a helper holding the post in its desired position, and a knife in hand, break the seal between the two ends of the container. As you mix the two sides together, a chemical reaction happens in the bag, resulting in an expanding foam. 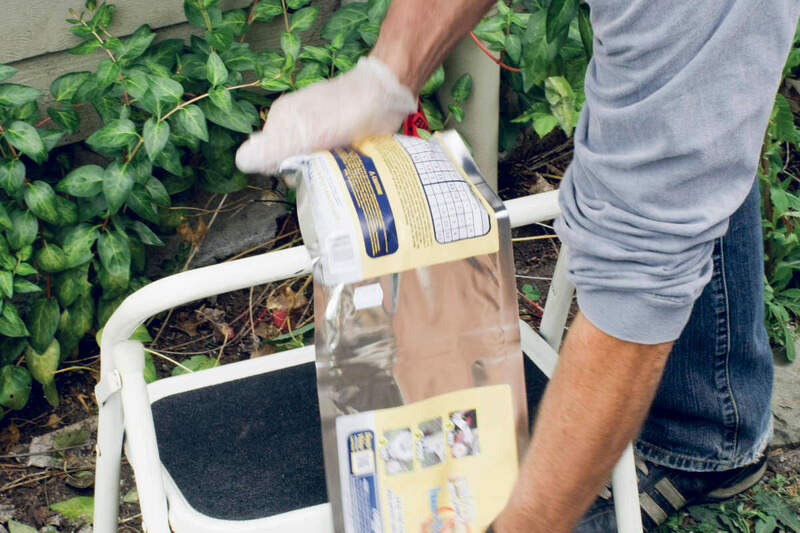 After about 30 seconds, cut open a corner of the bag and fill the expanding foam around your post. As it expands, the foam will anchor your post tightly against the sides of the hole. 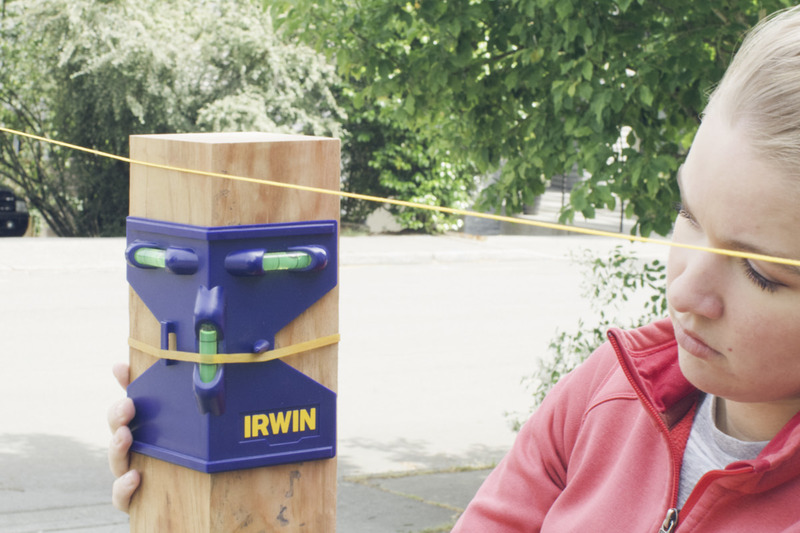 This method has been used for years on things as large as utility posts, and it works great. There’s no need to brace the post—it’ll hold just fine. Once it’s dried, trim away any excess foam. 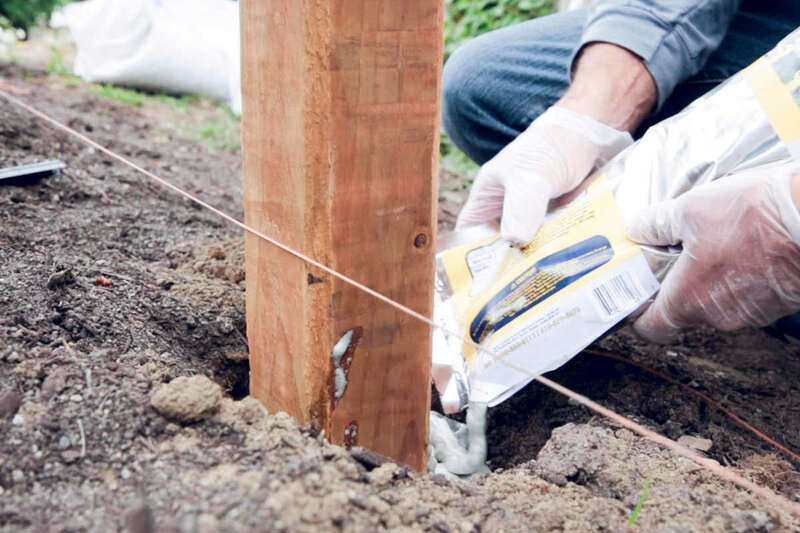 Most stretches of fencing will require several posts or more—so choose a setting method that fits your timeline and budget. Off you go! You’ll get the hang of it in no time at all, and you'll be one step closer to your very own DIY fence—ands you can learn how to build three types of fences by visiting our vertical fence, horizontal board fence, and framed-panel fence tutorials. Learn how ground walnut shells and coating from Daly's pair up to provide a non-skid rainproofing solution. It's quick, easy, and inexpensive!